I am an avid woodworker. During Christmas, we would typically decorate the house with a Christmas Tree and the Nativity scene called Belen, spanish for Bethlehem. Years ago, we invested in a ceramic nativity set . Unfortunately, the figurines do not include a manger and there is actually none in the market whether here in Singapore or back home in our native country, the Philippines. 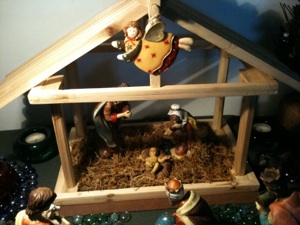 I initially built a manger from scrap wood 7 years ago and we have used this every year for the years. moving to Singapore damaged the structure and during a move from one rented place to another, the manger got lost. Our second manger is built from pinewood shoe rack. It is designed to fold and lock perfectly flat for the months long storage between Christmas seasons. We have given a replica as a gift and it was well received and admired. If there is a demand we will certainly consider manufacturing a small quantity. Another Christmas, We’ve added an angel and a spotlight to the Belen. True to its promise the nativity manger setup in 30 mins. Most of the time spent doing the artful landscape and lighting around the main piece.